If you find yourself in Southwark on Charles Dickens's two-hundredth birthday on Tuesday, 7 February, you could visit Southwark Cathedral and take part in their bicentenary celebrations. There will be a day long exhibition of letters and first editions; a full peal of bells between midday and 4 o'clock; a guided walk of the area at 2.30; Choral Evensong will mark the writer's birthday at 5.30 and Claire Tomalin (his most recent biographer) will be giving a talk at 6.30. If you can't make it to the Borough on that date, you could visit some of the locations associated with Dickens at your own leisure. 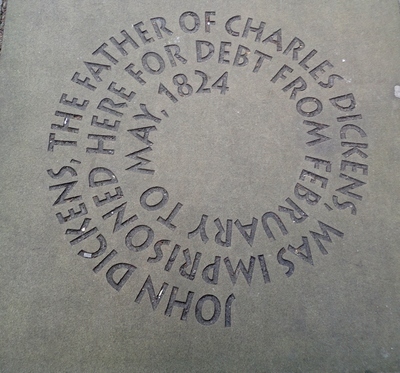 Although he was born in Portsmouth, Dickens is arguably associated more closely with London. He is famous for taking long walks around his adopted city, especially at night, and the capital features prominently in his novels. His association with Southwark begins with his father's period of incarceration in the Marshalsea prison in 1824. In his biography of the writer, Peter Ackroyd relates that 'Marshalsea was the place and the area which haunted Dickens throughout his life'. 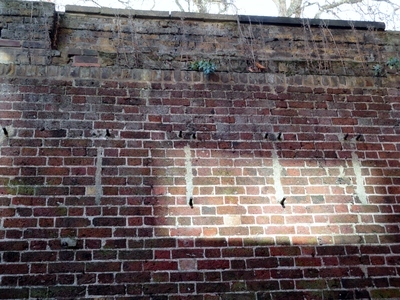 You can still see the last remaining wall of this infamous prison along one side of St George's Gardens, opposite Borough Tube Station. The gardens were once the grounds of the prison and are decked with old gravestones, many of them now unreadable. 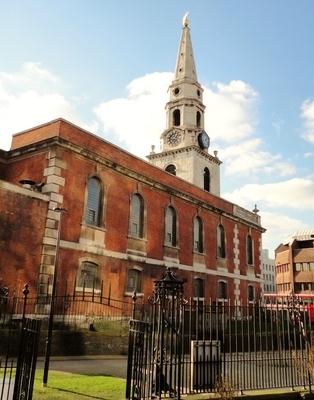 Close by St George's Gardens is the church of St George the Martyr, built during the 1730s. The church features in Little Dorrit; the eponymous heroine is born in the Marshalsea and marries Arthur Clennan in the church. 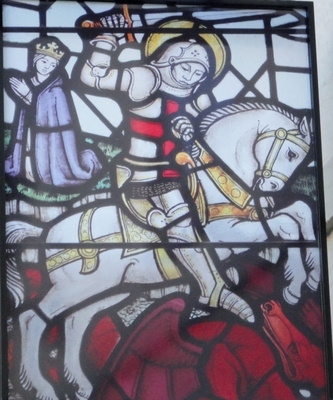 She is also portrayed in one of the church's stained glass windows. A little further along the High Street, Angel Place, the alleyway between the prison wall and the John Harvard Library (the man who founded the famous American university was born in Southwark) bears reminders of Dickens and his father. 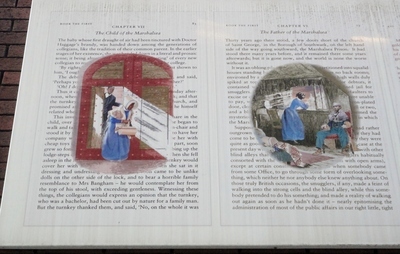 The connection with Little Dorrit is again underlined with illustrated extracts from the novel high up on the wall. Walking back along the High Street in the direction of London Bridge you will pass the former yard of The White Hart, where Mr Pickwick encounters Sam Weller cleaning boots (in The Pickwick Papers). 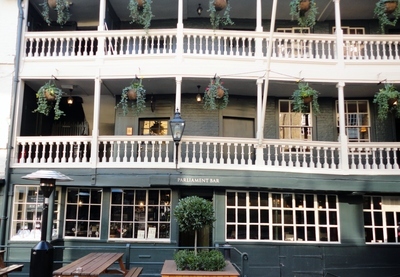 You can also visit The George, London's only remaining galleried coaching inn. The pub is mentioned by name in Little Dorrit, but the description of The White Hart (in The Pickwick Papers) could equally apply to the galleries and staircases of the George. 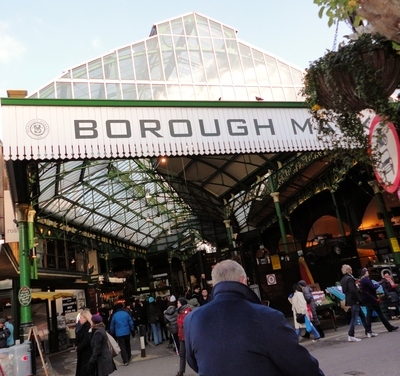 You can pop into Borough Market on your walk and remind yourself that a drunken Ben Allen (again in The Pickwick Papers) knocked on the door of the Market Office, although the present day office has since moved. Make your way from here round to Southwark Cathedral. When the twelve-year-old Dickens was working at Warren's Blacking Factory at Blackfriars Steps (whilst his father was in prison) he would have passed the Cathedral (or St Saviour's church as it was then called) on his journey from the Marshalsea to his place of work. In The Uncommercial Traveller he refers to Gower's tomb in the Cathedral. Sometimes it can be difficult to separate the London that inspired Dickens from the London he inspired. He borrowed names of characters from people he met in London. Mr Pickwick's name is taken from the Bath stagecoach line that was run by Moses Pickwick and the boy Charles worked with Bob Fagin in the blacking factory. Reciprocally you can spot Dorrit, Copperfield, Pickwick and Quilp Streets in the local area. It is not easy to walk the street of the Borough and not be reminded of Charles Dickens.